1. Do you travel or stay local? Family or Friends? Host or Guest? We stay local, only 1 year out of the last 16 have we traveled for Thanksgiving. We always go to My Parents house with my siblings, and although we are guests because we go there, we are also considered hosts since we bring half of the meal with us. 2. Parade: Love it? Leave it? Never let it go? I enjoy the Broadway performances before the parade, but would enjoy the rest of the parade more if they cut out the commercials. 4. Favorite holiday movie or do you watch football? The Dog Show of course. 5. 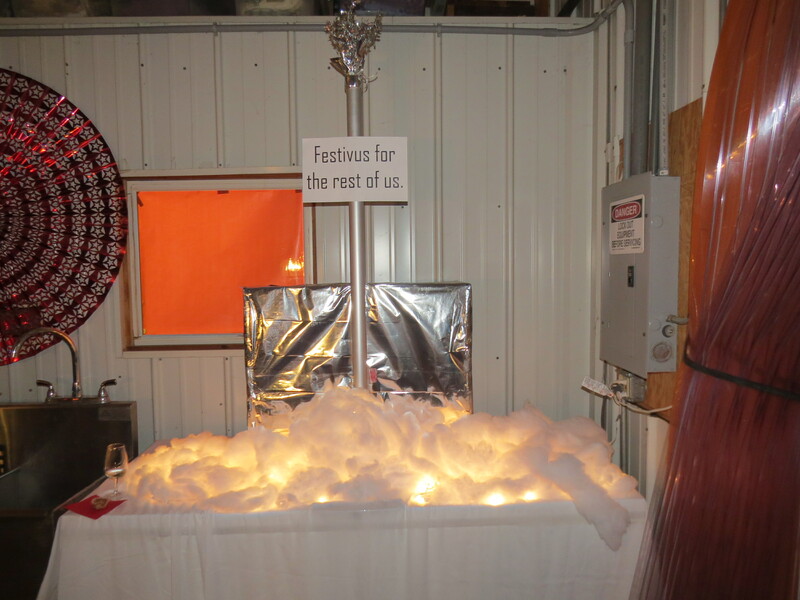 If you do holiday decorations, for which holiday and when? We don’t do very much decorating for Thanksgiving but in no way does a drop of Christmas decorations get put out until well after the Turkey is gone. Let’s do one holiday at a time. 6. Black Friday. Thoughts? Feelings? Soapbox? NO. MA’AM! I don’t work that day, the only place I leave the house for is Lunch with the hubby cause he has to work. People traditionally give thanks on Thanksgiving. What are you thankful for? I am thanful this year that my Mom is still here to celebrate with us. Although she can’t do what she used to be able to do, just her being here is enough for me. Coming home from a wonderful long weekend full of seeing Friends, eating good food, drinking Fabulous wine and full of enjoyment is never fun. 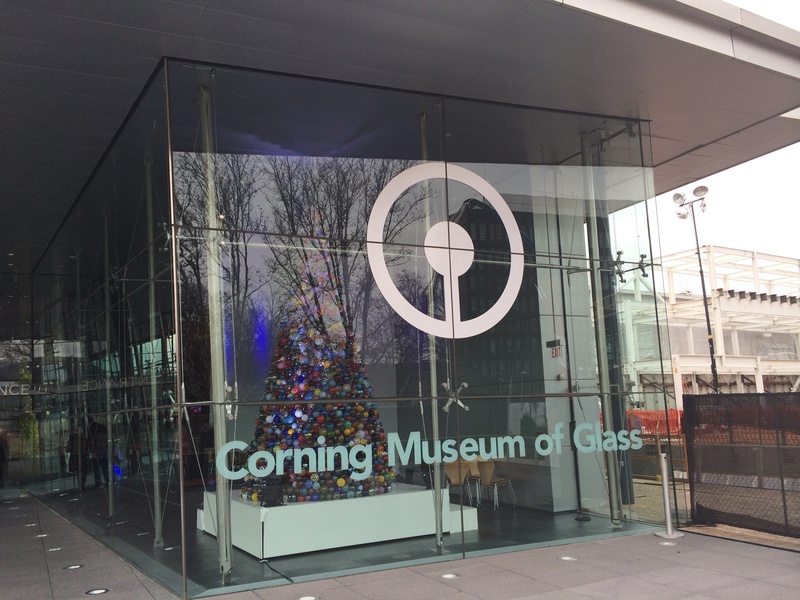 We left the motel and headed back to the Corning Museum of Glass to pick up our Blown Glass items and a few other things that were on sale in the marketplace. 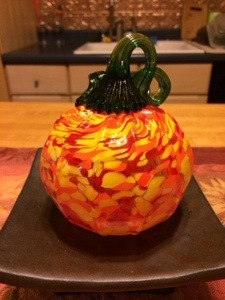 Here is the Hubby’s Pumpkin all cured, the colors are really very vibrant. 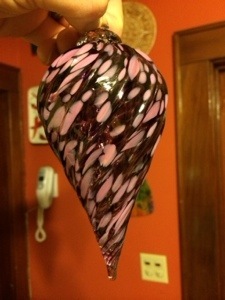 This is the Ornament I made, I think I did really well pairing the Pink and Purple together. 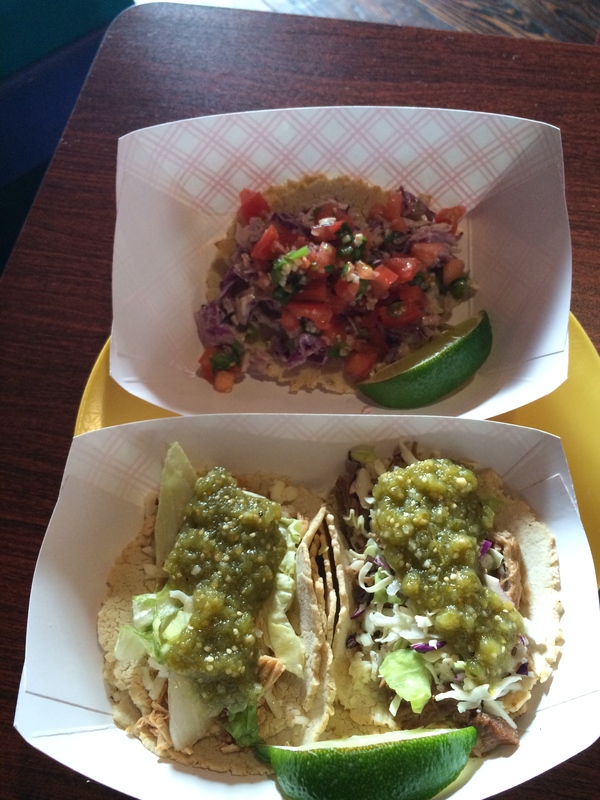 As become our custom, we always take the route to and from The Finger Lakes via Owego, NY so that we can stop at our favorite Mexican Restaurant for lunch both travel days. This trip was no exception. 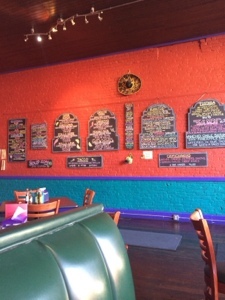 My only complaint* is the Menu on the wall just offers so much, it makes it difficult to decide. *and by complaint I mean, I wish I could have one of everything. 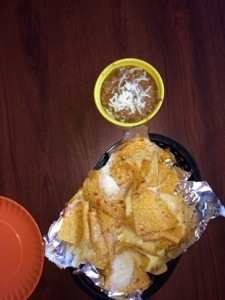 We started with the Beef and Bean Dip with Chips and Cheese. 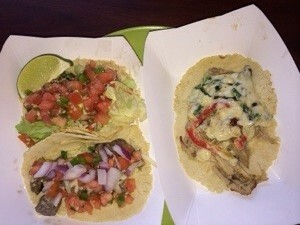 The Hubby and I both chose Tacos for lunch. Served on freshly made Tortillas with some of the best ingredients available. After lunch, the only other stop we planned to make was to a Distillery we saw signs for on the way up to the Finger Lakes. Since we didn’t have anywhere to be but home we figured what’s one more stop. 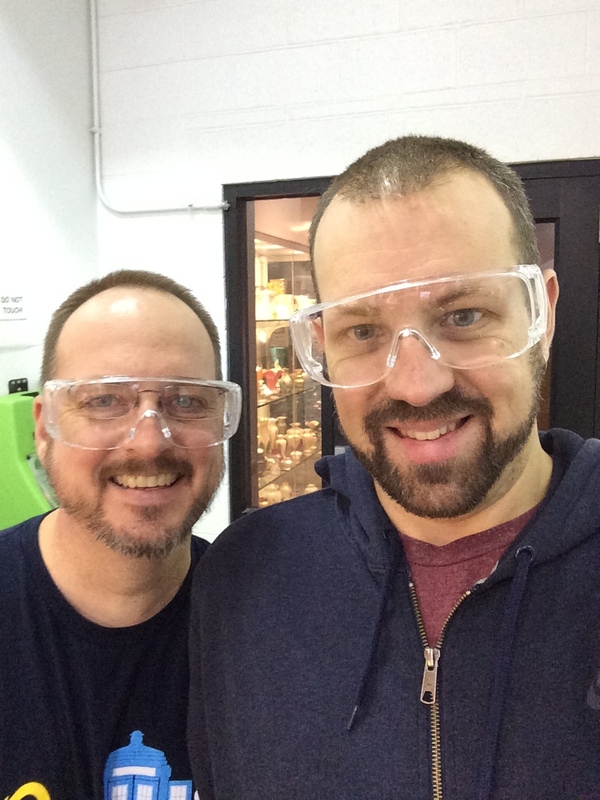 The Prohibition Distillery is the brain child of 2 guys who had enough of the corporate world and worked together to create Bootlegger 21 Vodka. We stopped in on Monday afternoon and were treated to a tour of the facility and the story of how the Distillery came to be. 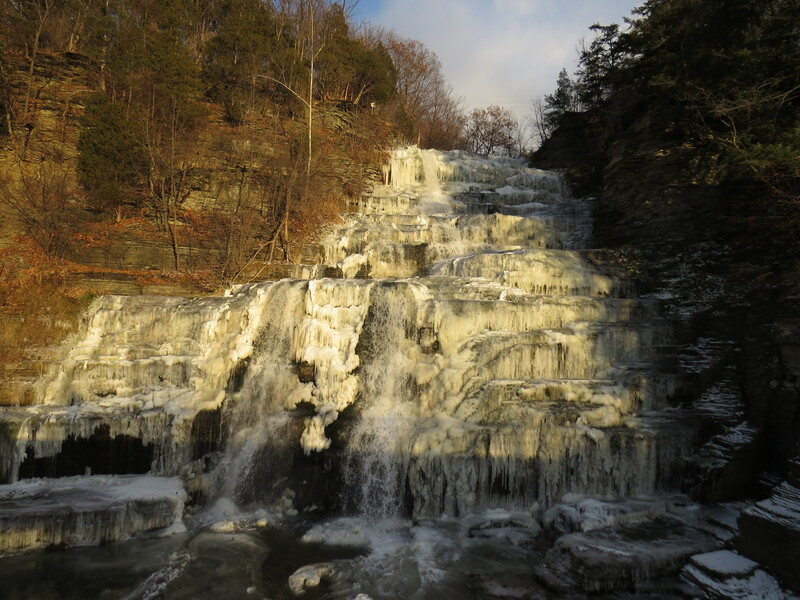 Located in Trout Town USA, Roscoe, NY this gem is well worth the drive. After our tour we sampled the Vodka which went down very smooth, without the little burn that most commercial vodkas have when drinking them straight up. 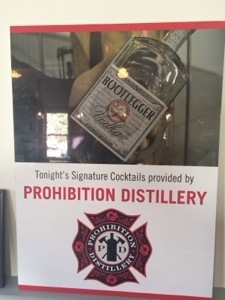 If you happen upon Bootlegger 21 in a local liquor store, buy it you won’t be sorry. After we unloaded the car we ran out to the pick up a few things we needed for the week, then it was home to unwind, make dinner, and prepare for the rest of the week ahead. The best news is that I got a text from my coworker that the office is closing at 12 on Weds, so I will only end up working a day and a half this week, all from home. 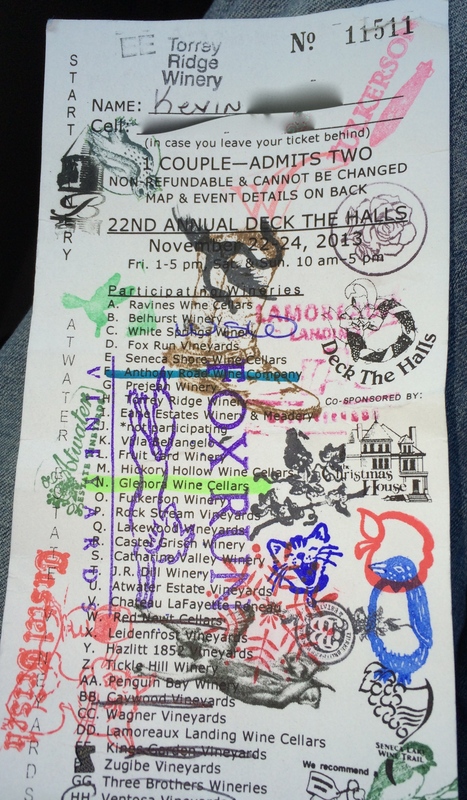 So this is what the Deck The Halls Ticket looks like when you pick it up from your host Winery, in our case it was Atwater Vineyards. This is what the ticket looks like when you are finished 2 1/2 days later. 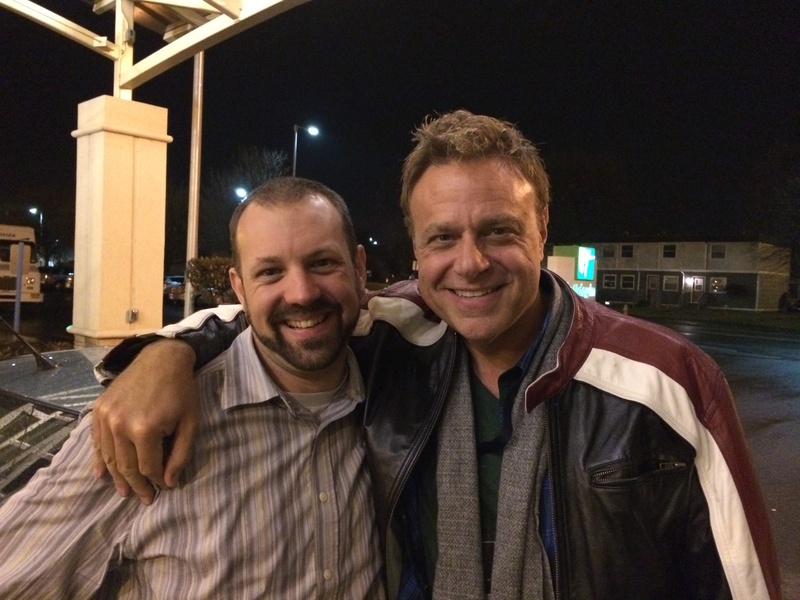 This is what 2 guys enjoying themselves beyond belief look like. I actually sent this picture to our friend Steven and his now Fiance Paul on Saturday night right before Paul’s big 50th Birthday Party that we were missing because of our preplanned weekend away. Day 3 began early as we had made plans to meet a twitter friend for breakfast over in Ithaca at a really great brunch place we found a few years ago right near the Cornell campus. 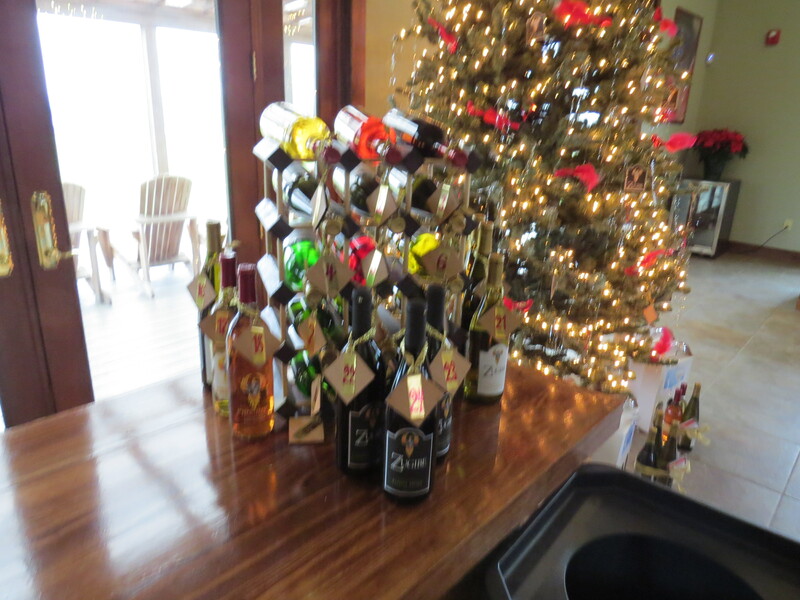 After a nice leisurely meal, I had a fabulous Red Quinoa, Turkey and apple Omelet, The Hubby had the Brie Stuffed French Toast, we set off to tackle the Last 11 wineries on the Deck The Halls list. Sunday’s agenda was (EE) Kings Garden to (S) Catherine Valley. 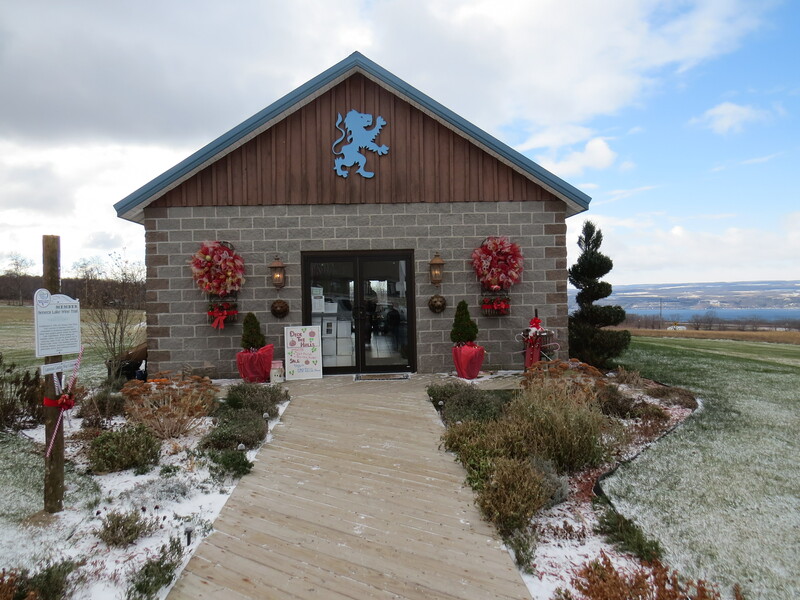 In addition to those we added 2 other stops, one to a place The Hubby likes to restock the basement, the other was not a winery but Finger Lake Distilling. We sampled some Vodka, Whiskey, and Maplejack Liquer. We also picked up my brother a bottle as a thank you for watching the Dogs. Kings Garden doesn’t have a large tasting room but they do have very good wines with names like Royal Pain, Sinister Sister and Wicked Wench. 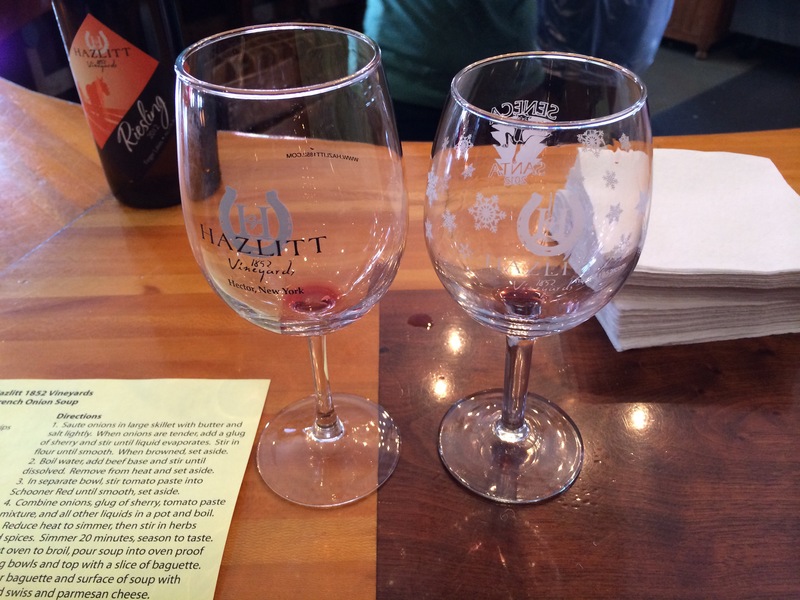 Hazlitt is another of our favorites from Grapehounds weekend. Not only do they host the Welcome Reception but they make a mean Wine Slushy! They won the prize for best food option with their French Onion Soup. 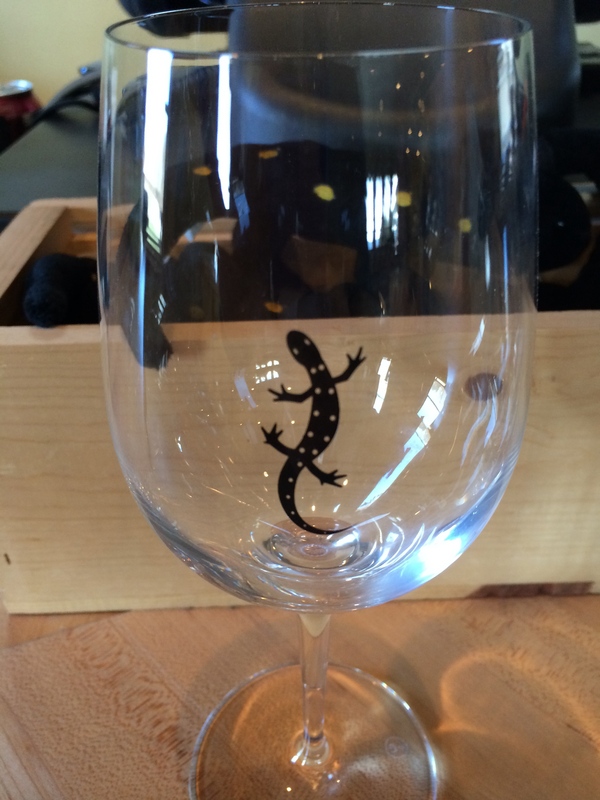 The logo for The Red Newt is really cute. They had the second best food pairing of a Sausage Meatball. The Hubby took this video at one of our close to last stops, I think we did 3 more after this one. 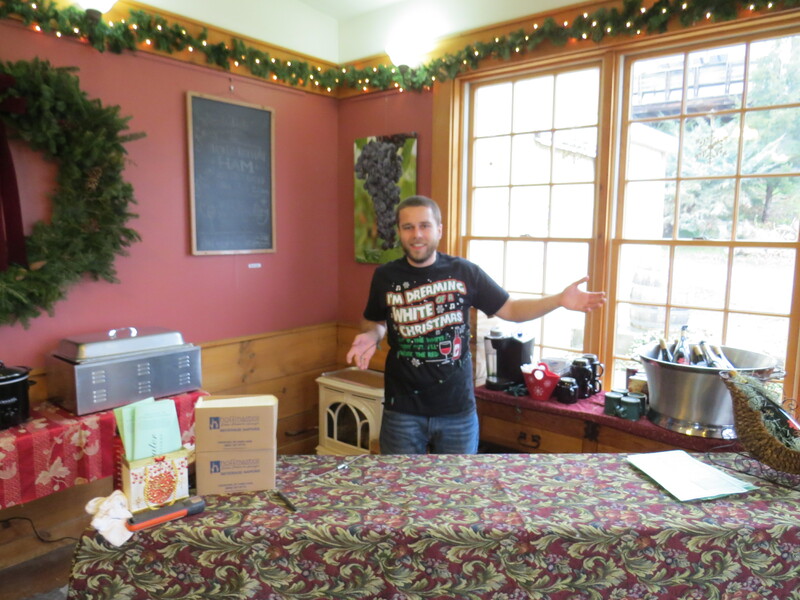 It makes me happy to know that the Staff at the Wineries can have just as much fun as the patrons of the wineries during the Deck Halls Weekend. 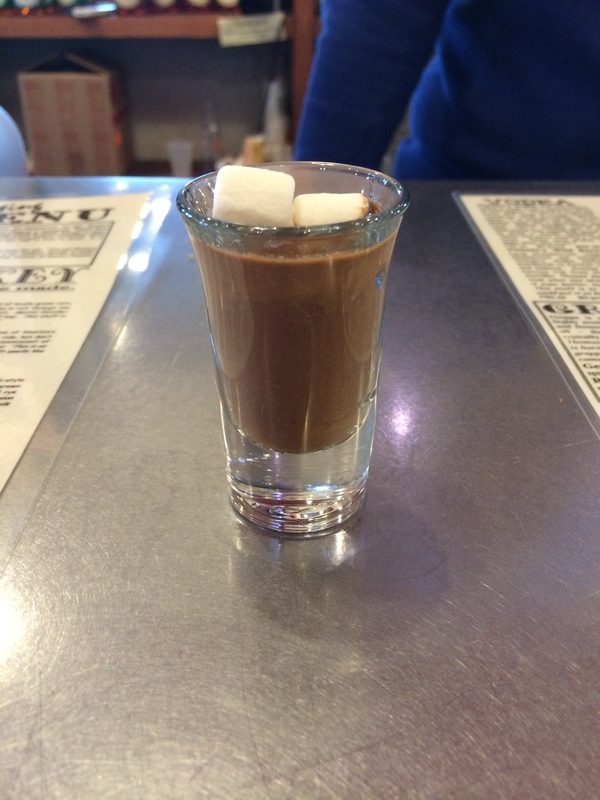 While at the Distillery I enjoyed their weekend special sample of a McKenzie Pure Pot Still Irish Hot Chocolate. 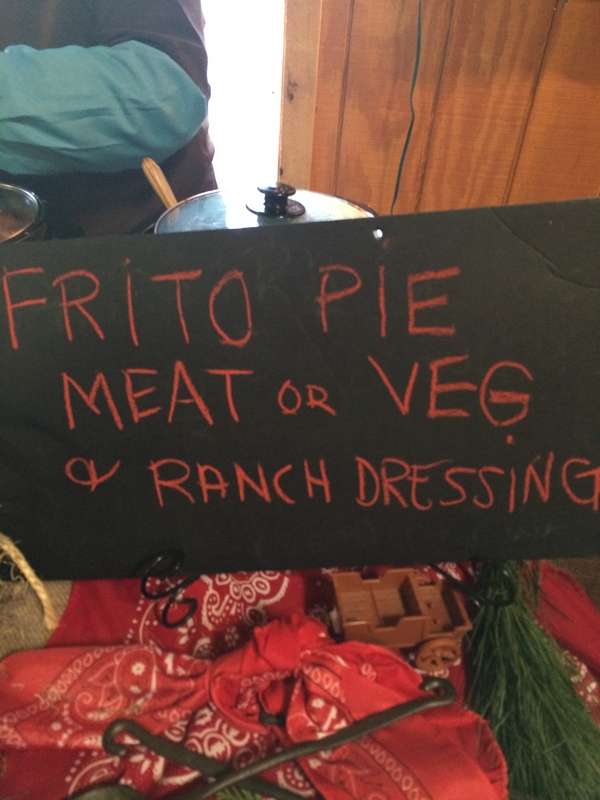 At the last stop they had another of our favorite food pairings, Frito Chili Pie! On our way back the Motel we had to pull over on the side of the road to capture this picture of Hector Falls Creek. We pass by this in July when we are up there but it was simply amazing with the ice covering the rocks. 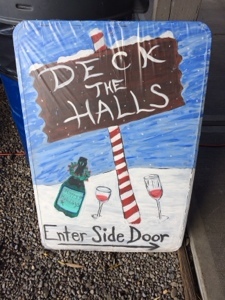 When all was said and done, we visited 31 of the 33 Wineries participating in Deck The Halls, plus 5 not on the list, over the course of 17 hours covering 81 miles of Lake. It should have been 34 wineries but one opted out of the weekend at the last minute, and 2 of them we opted to skip based on previous experiences there. In total for the entire weekend round trip we drove 845 miles. Day 2 began chilly and windy but Sunny, though Mother Nature had a few Mood Swings as the day went on. 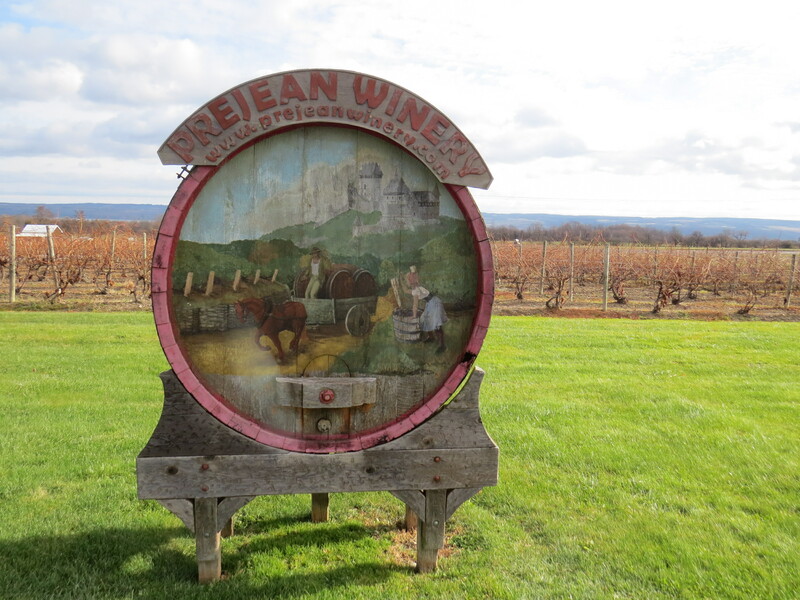 Saturday’s agenda was the West Side of the Lake (G) Prejean Winery through (R) Castel Grisch, this would be another 10 to tackle between 1o and 5. Well it was more 11-5 for us since we got a bit of a late start and stopped for breakfast on our way up the lake. Last year we found this local diner called The Crossing, their theme being Trains since they sit right next to the only railroad crossing on this side of the lake. No frills, no fuss, all the locals are regular, including Froggy who everyone in the place said goodbye to. The food is nothing short of great, I mean it is a diner but damn the omelet was so good. 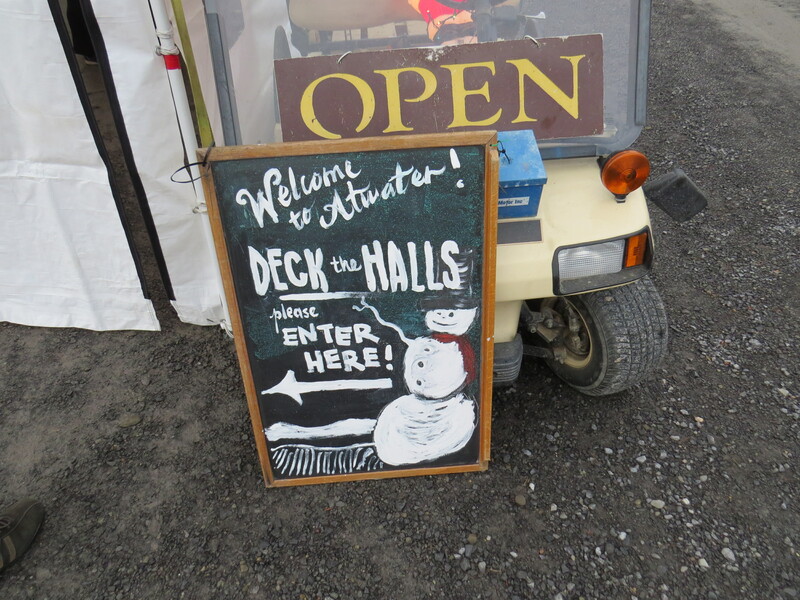 Of the 13 wineries we stopped at today, 3 weren’t on the Deck The Halls trail, and 2 of them were new to us. The Barnstormer has only been open 8 weeks but they have a good thing going. We hope they get involved in the Grapehounds weekend, but even if they don’t we will definitely visit them again. The Hubby bought a new camera and was taking pictures this one was cute! 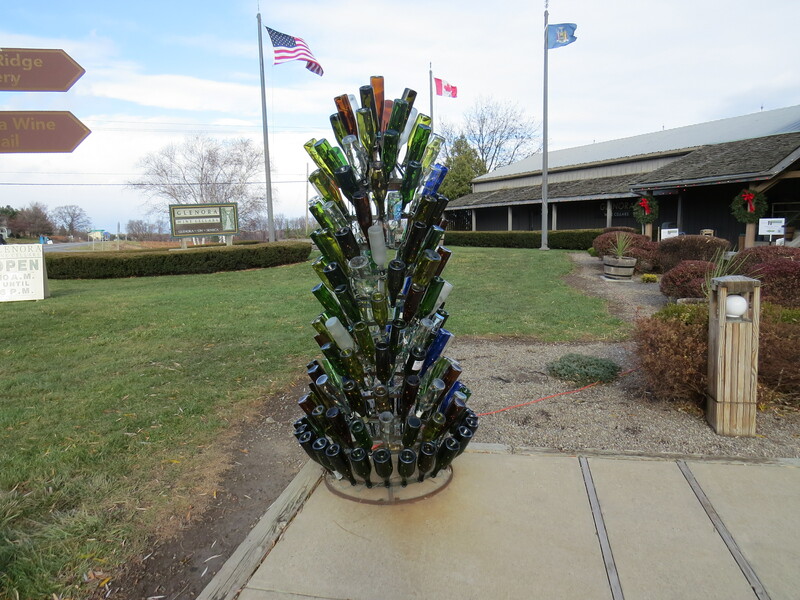 There are a few wineries around that have these bottle sculptures. Looking at the pricing of them (around $800-$1000) it would be a nice thing to have. We would of course supply our own bottles. 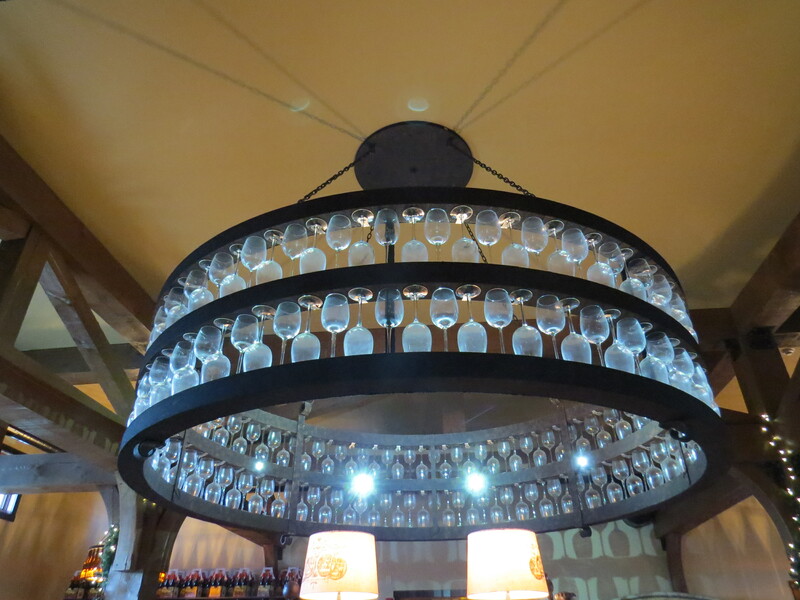 One of the wineries we hit today that wasn’t a part of the weekend has this awesome chandelier. 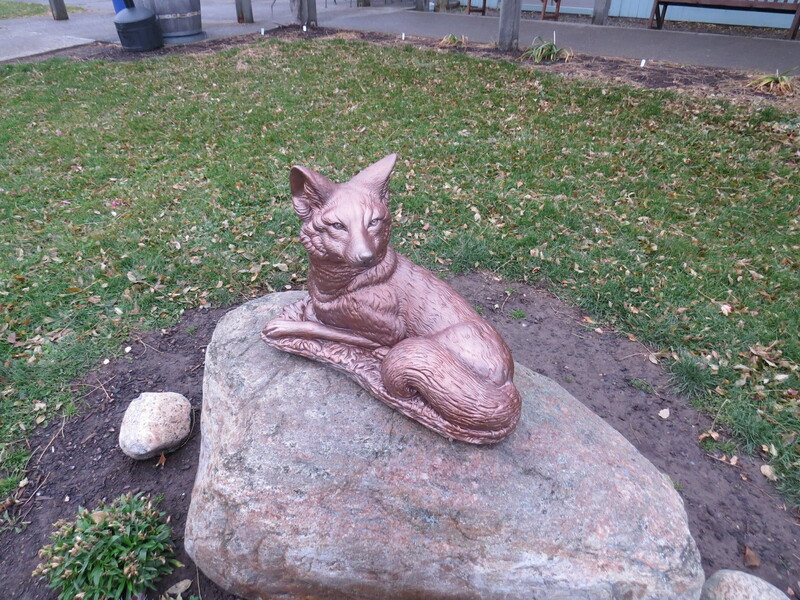 Someone from Cornell University made it and installed it. They have learned that the glasses will just stay dusty because it’s too difficult to clean. Plus they broke one glass already and don’t want to break any more. This winery may look fancy but their theme is Redneck wines. The wines are alright but we prefer the Mead from their sister company on the same compound. 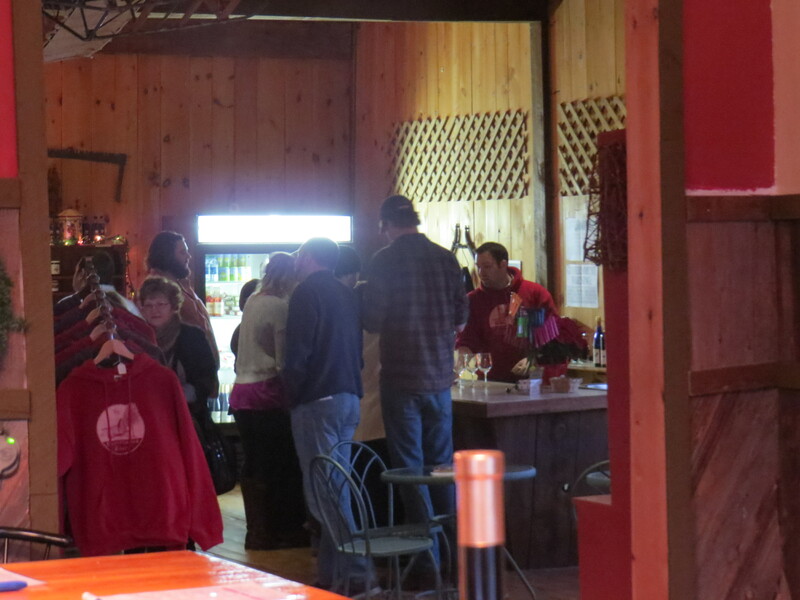 One of the new Wineries on the Grapehounds trail has a wine called Red Scooter. 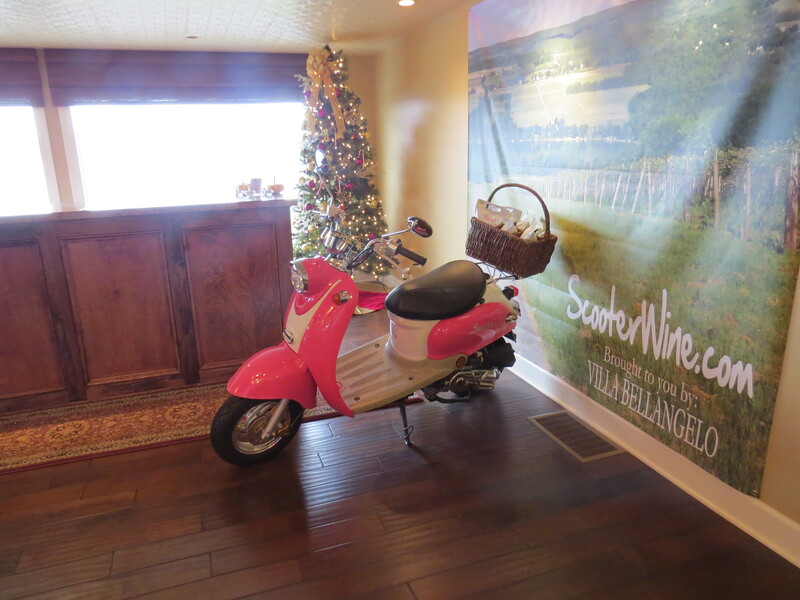 They also have a Red Scooter in the tasting room. 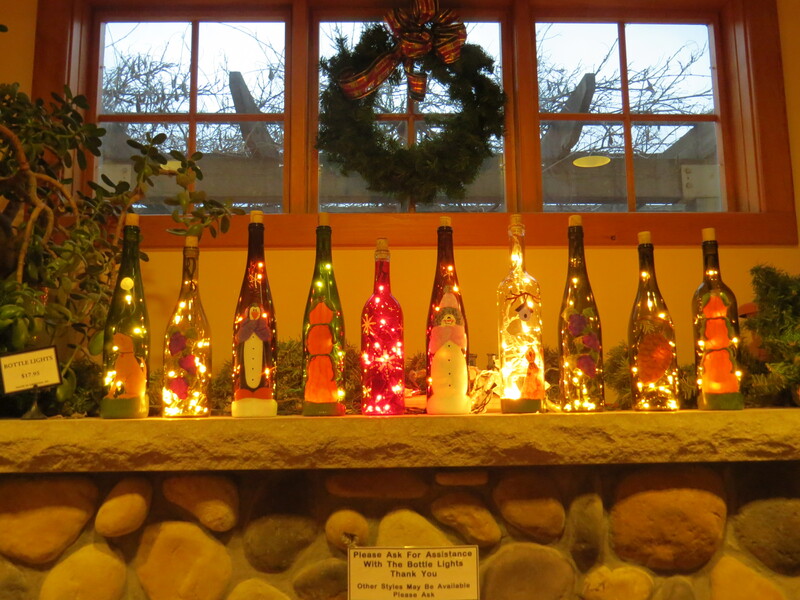 Quite a few of the wineries were showcasing Wreaths of Deck The Halls past. This year was year 22 for the event. 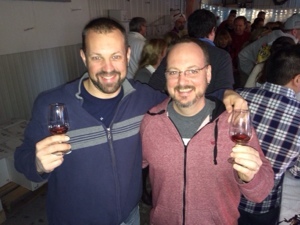 While we were tasting at the Barnstormer this guy came in, and had to duck underneath practically every door way. The hubby made me go stand next to him for a height comparison. Although there was some snow over the weekend it didn’t keep us from enjoying ourselves.I mean how can you not enjoy a view like this. Saturday was the Day of The Doctor so the Hubby and I had to wear our Dr Who Shirts. 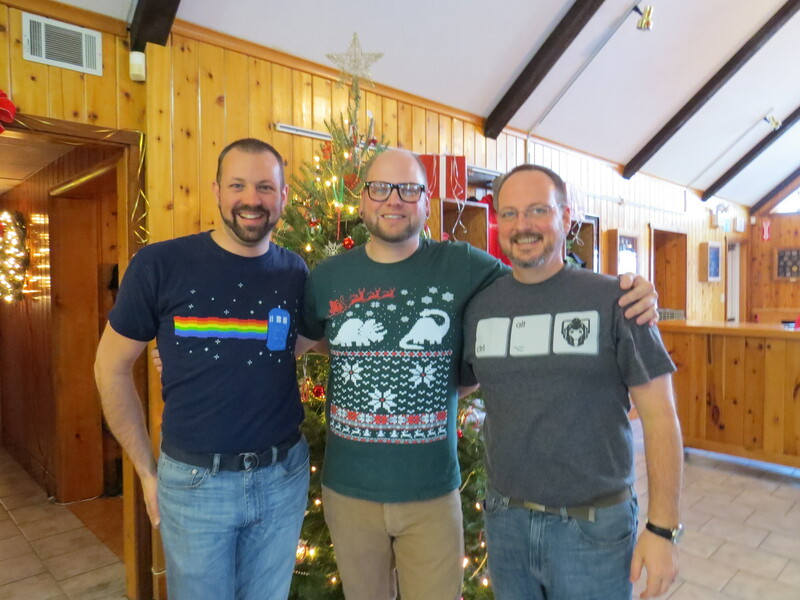 We wanted a picture with this guy and his fancy Christmas T-Shirt. This is Tracy. Tracy is CRAZY! We love Tracy. He works at one of our favorite Western side of the lake wineries Lakewood Vineyards. We love the wines there, The Hubby especially likes the Port, and the Staff is amazing. Tracy remembered us from our last trip up here in July. I told him we wanted a picture of us with him and this was the first one that was taken. Like I said, he’s Crazy. Lakewood had a Festivus pole on display along with all of the other Holiday Decorations. 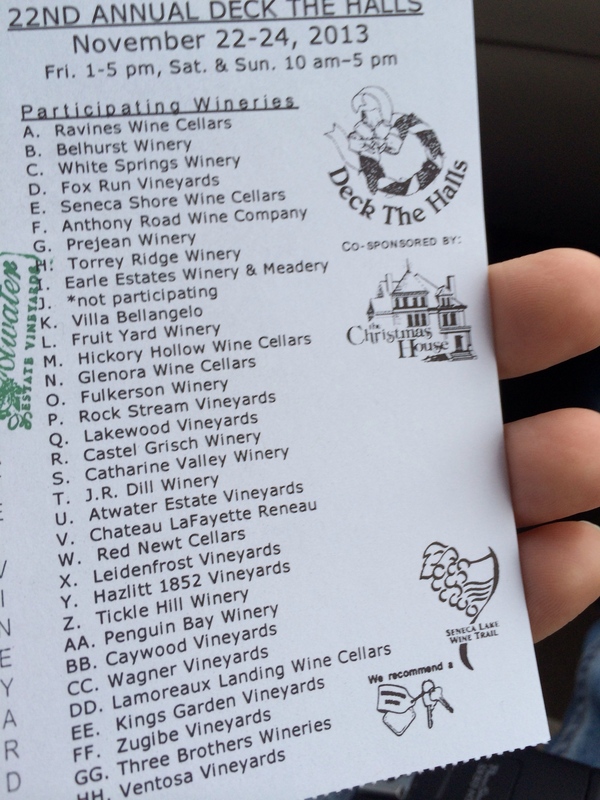 The total now for the first day and a half of the event is 22 wineries, over the course of 10 hours. Stay tuned for the Day 3 (Sunday) recap. 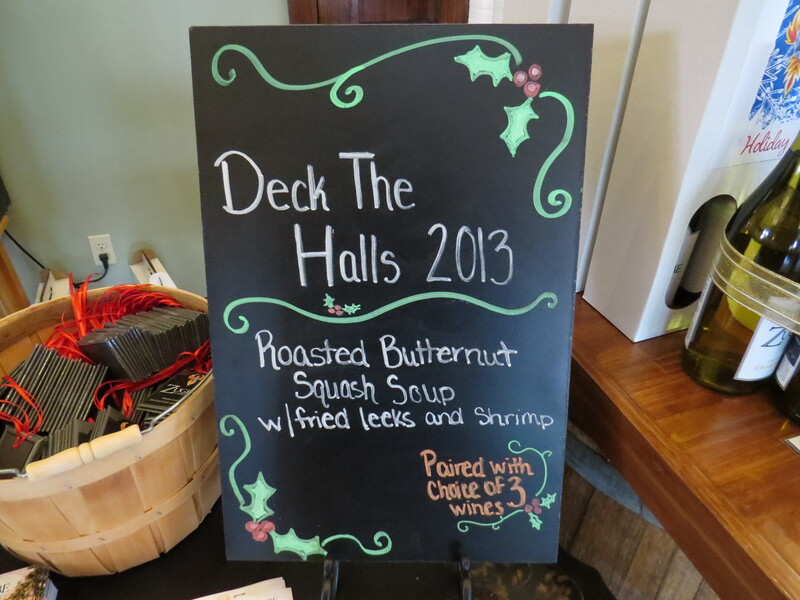 Friday was the official start to the Deck the Halls weekend up here in the Finger Lakes. 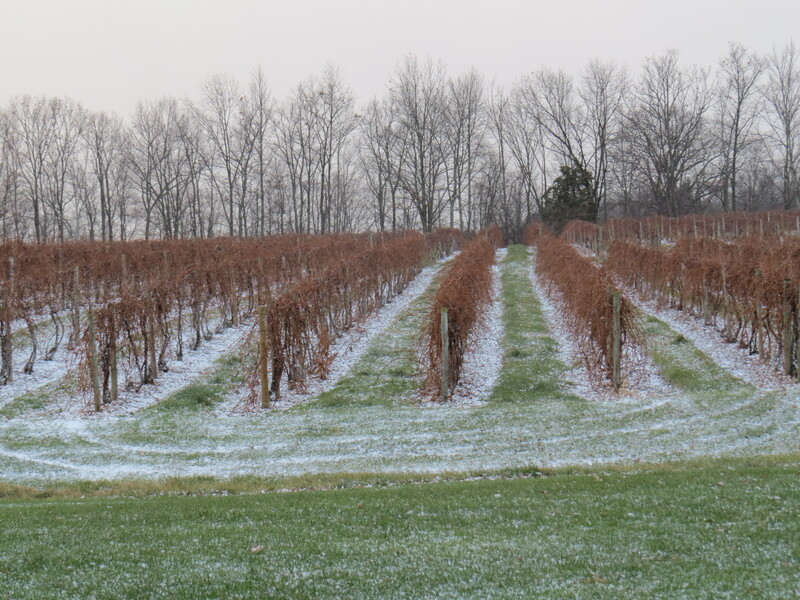 After a good breakfast and a stop for a sandwich for Lunch we headed out to tackle the Northern End of Seneca Lake and see how many wineries we could squeeze in, in the 4 hours allotted for the day. 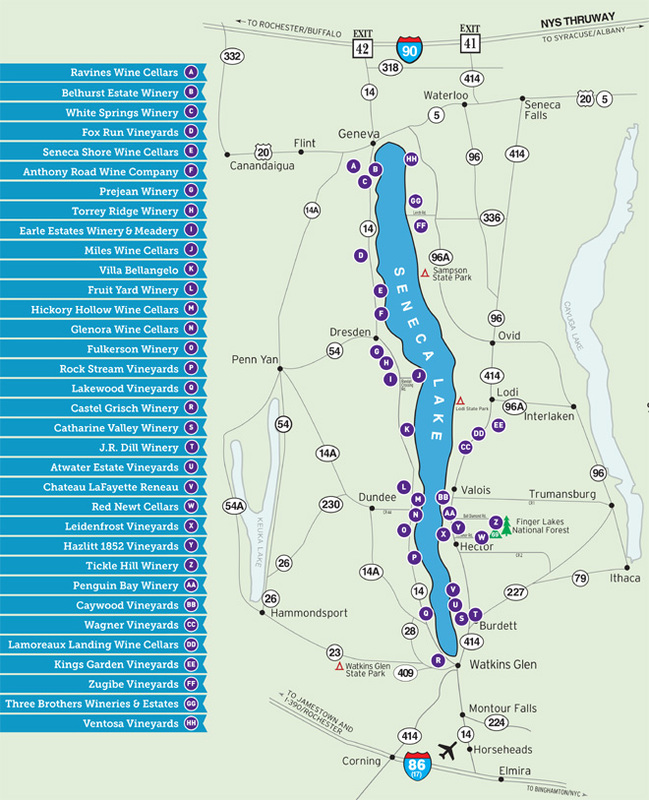 The map below it the entire weekend’s worth of wineries participating in the Deck The Halls weekend. We Started on Friday at Winery (FF) Zugibe Vineryards, our goal was to go north from there and around the top of the lake. We made if from (FF) and stopped at (F) Anthony Road before we ran out of time, which made 9 wineries in 4 hours. 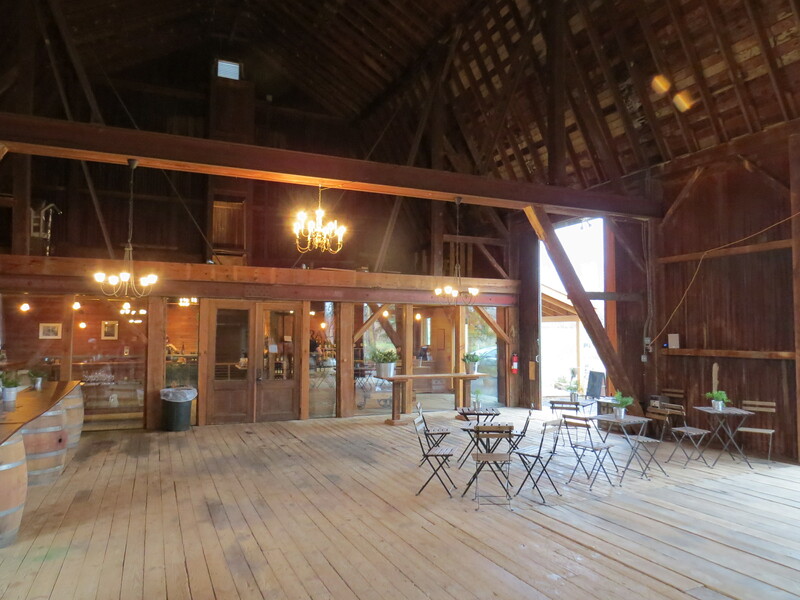 The wineries each offered a food and wine pairing, and most offered a smaller additional tasting of 2 or 3 wines. 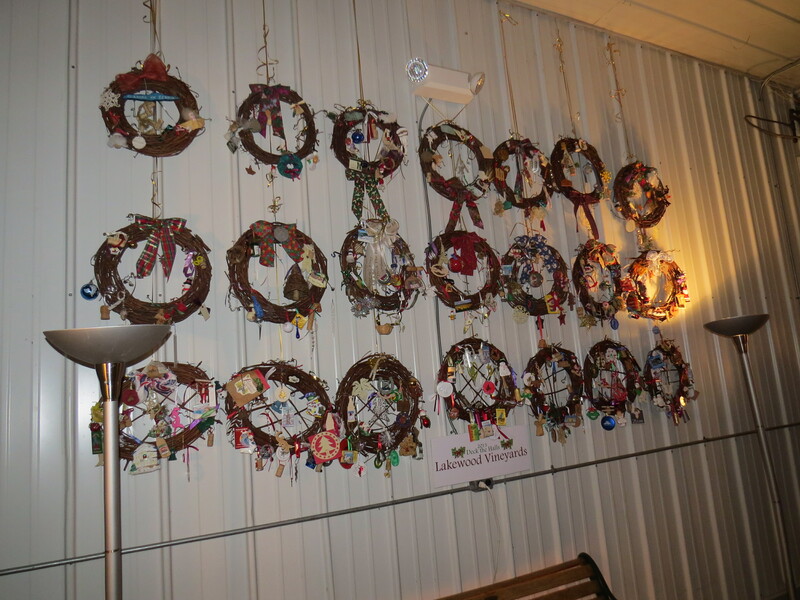 Along with the food and wine we got a Wreath made from Grapevines and each Winery offered an ornament to decorate the wreath with. Some are pretty damn fancy, others were just alright. 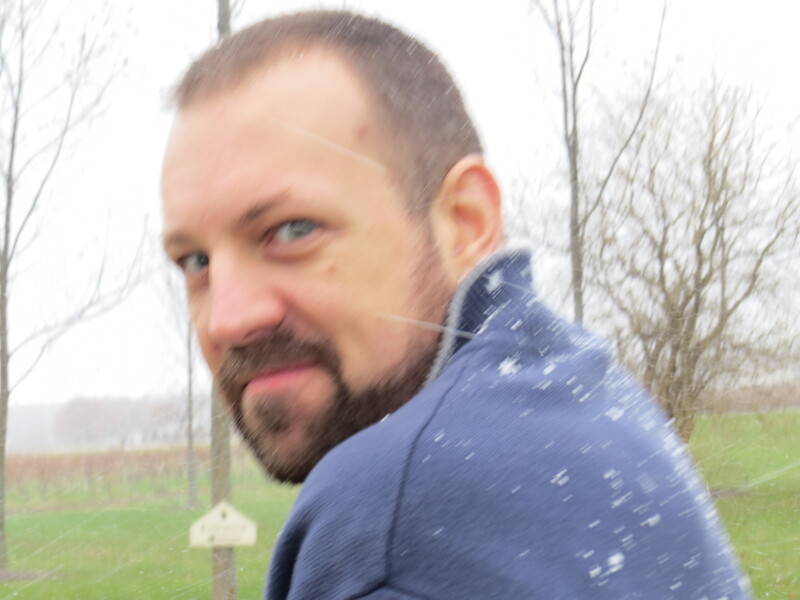 We have been having a great time, and below are some of the pics I took at the wineries. I should have taken more I know. 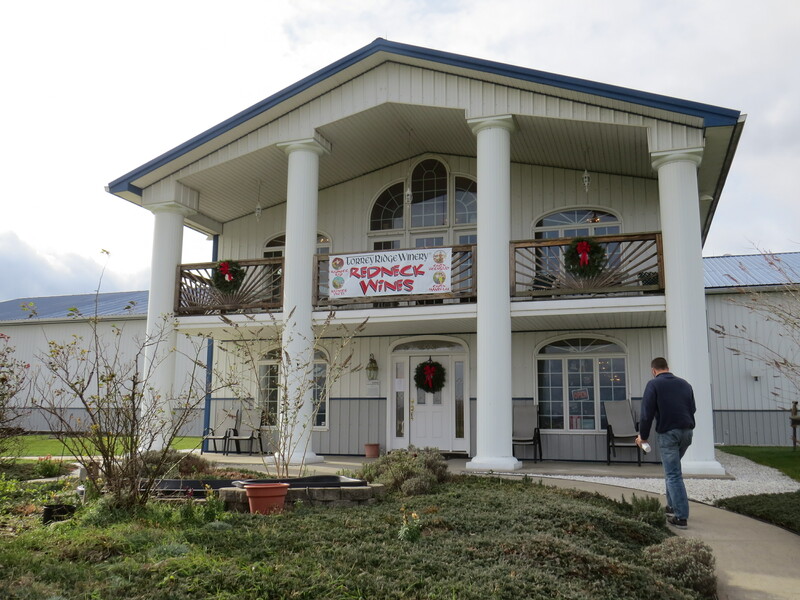 This was the winery we picked for our Starting Winery, we did that based on the fact we are very familiar with them as they are the host Winery for our July Grapehounds weekend. This is the best Advent Calendar I have ever seen. By far the best food pairing of the Day. I am glad we have a recipe booklet to make this one again. After we spent the day winery hopping we had a quick little break back in the motel room, the hubby had a nice little nap, and then a quick change of clothes while we waited for our friend Toppie to meet us. 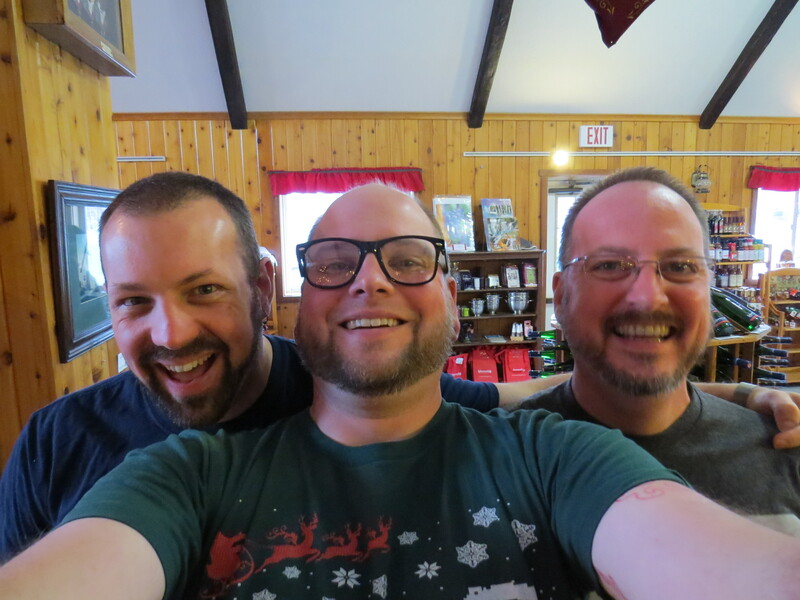 Toppie does a podcast called The Smellcast and lives up in the Finger Lakes area (which he refers to as Pickle Hollow), so when we decided to come up we asked to see if he was free for dinner. 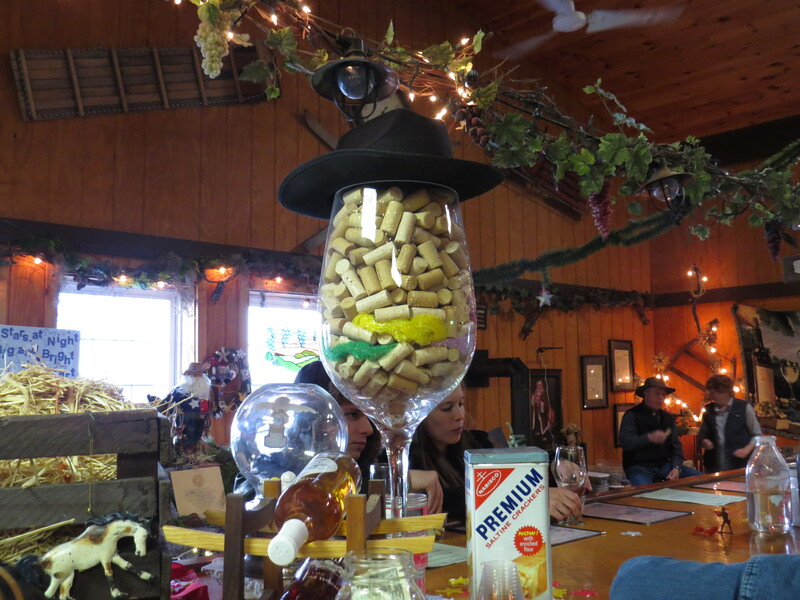 I made reservations at the German Restaurant at one of the Wineries we planned to hit on Saturday. Castel Grisch has a German Buffet they offer on Friday and Saturday nights. The 3 of us spent a lovely couple hours, chatting and eating and drinking. It was a lovely night out and we look forward to seeing Toppie again in July when we come back. I say Day 0 because it was technically the travel day, although it was full of plenty of things besides driving. The trip was a relatively smooth one, traffic was light and the weather was fair to mediocre. We did hit a little snag (literally) on the highway after lunch, we ran over something, that didn’t make itself known until later in the evening. We actually just returned from breakfast and a local garage getting the exhaust heat shield zip-tied back onto the car so it won’t rattle anymore. Thankfully it didn’t cost much and the guys at the local garage were able to fit us in. The first stop was lunch in Owego as I alluded to yesterday’s post. 2 years ago we decided to take an alternate route home from our summer Grapehounds weekend and stumbled upon this place for lunch. Yesterday marked our 4th visit in 2 years, and yes we will be making it 5 on Monday when we head home. 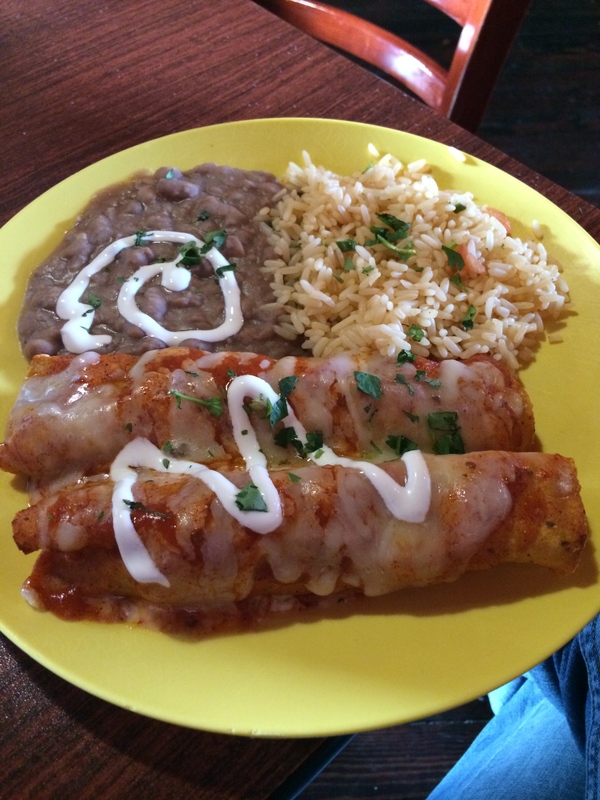 Good Mexican food is hard to find in the Northeast. We are lucky to have a local place that we like. To have found this gem in Central New York was a great day. I had the Chicken Enchiladas, and not pictured was the basket of Chips and Salsa we shared. The Hubby ordered 3 tacos, all served in homemade corn tortillas. 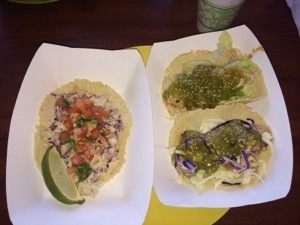 I had a bite of the fish one and it was amazing, I may be having that for my lunch monday. 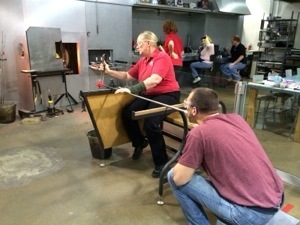 After lunch and the running over of things episode we made our way to The Corning Museum of Glass. 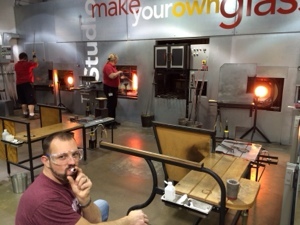 In researching the trip the hubby happened upon some glass blowing workshops the museum was offering. 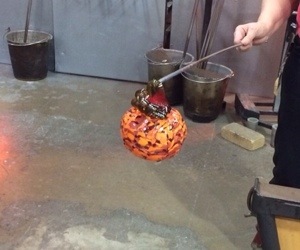 For $29 each we got to go behind the glass shield and help a resident glass blower design and make a Pumpkin and an Ornament. Now we didn’t get hands on, it was more mouth on. 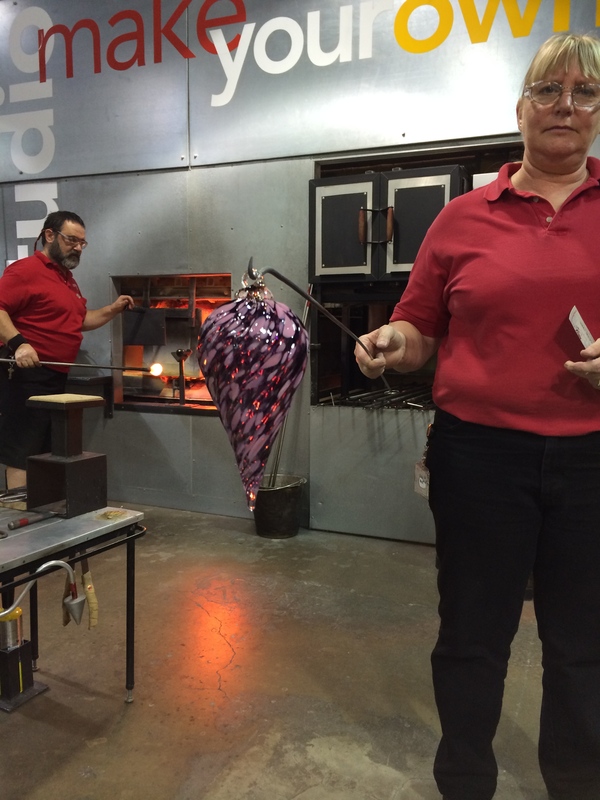 The expert handled the molten glass and the spinning and rolling, and we supplied the hot air. Overall it was a fun experience that I think we would do again. We have to go back on Monday on the way home and pick up our stuff. 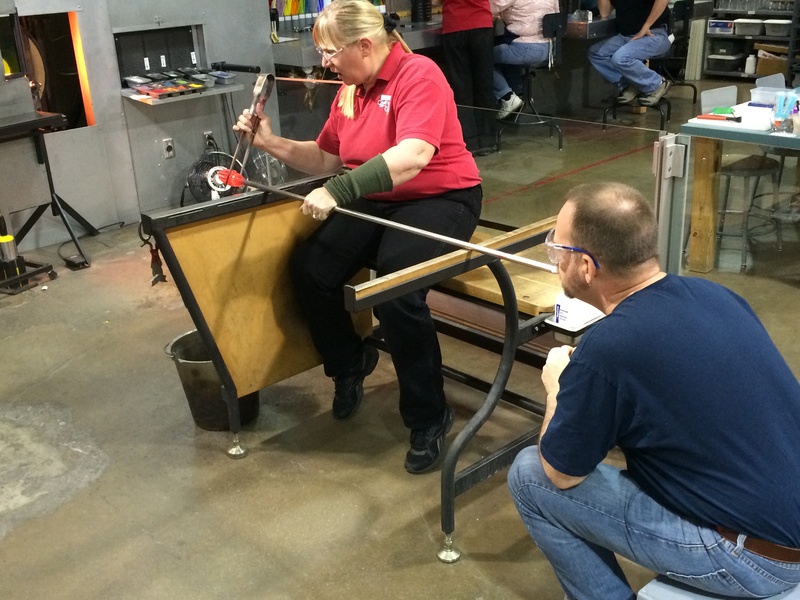 Here we are serving you glass blowing realness since Nov 2013. This is the position we assumed for blowing, Glady was the expert here and she was lovely. Here is the pumpkin The Hubby made. It looks darker than it actually will be when we pick it up just due to the temperature of the glass. This is my ornament, I chose violet and pink for the colors to use and I think it will look fabulous. After we blew our glass we perused the Market Place at the Museum, we picked out a few things we will pick up on the way home, we hopped back in the car and headed over to the Hotel to check in. 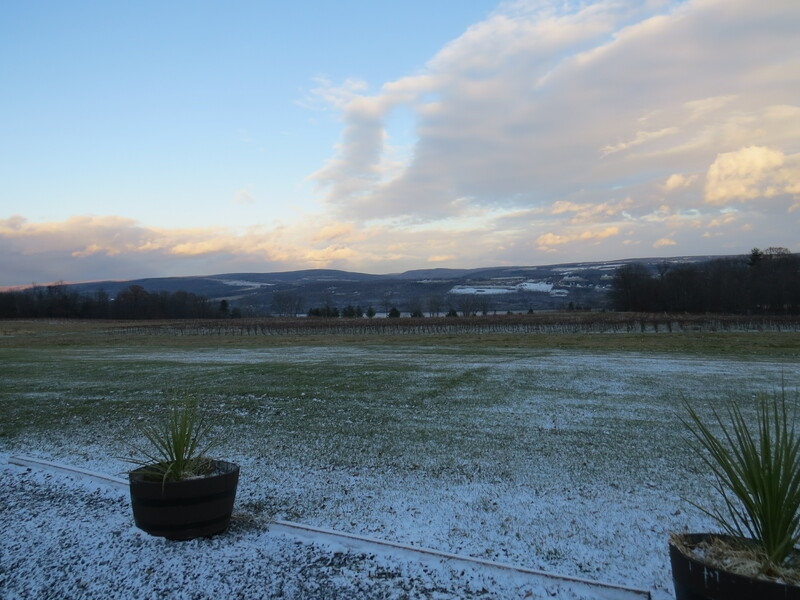 The Motels up here are pretty much no frills and in the winter many aren’t even open as there just isn’t a high demand for wine touring in the colder months, with the exception of this weekend and the weekend after Thanksgiving. We have a lovely King bed, I got a good deal on it for the weekend. 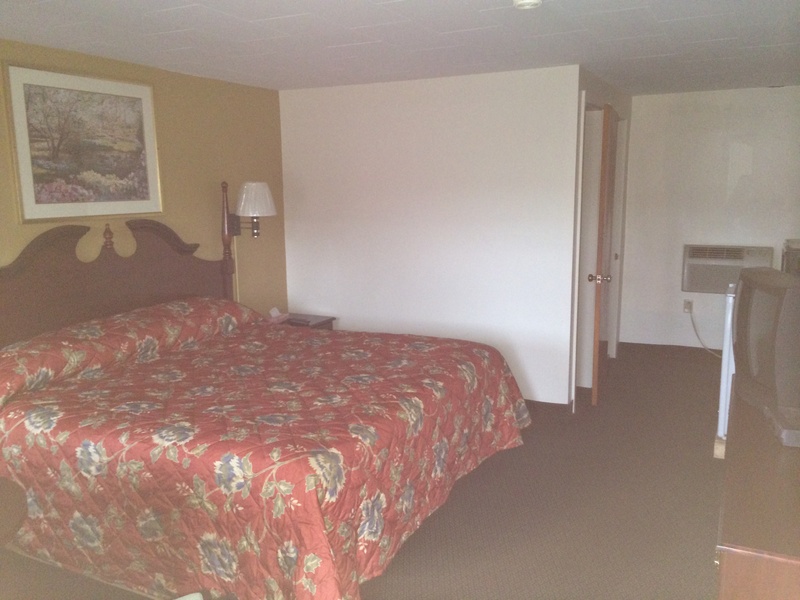 It also looks based on the 2nd picture below that we have the entire east wing of the motel to ourselves. Upon further investigation it looks like there is someone else staying a few rooms over from us as there was a car there when we got back from dinner and the show. After a quick unpack, rest, and change our clothes we headed out to find some dinner about a half hour away in Elmira, NY. It’s tough to find a place to eat when you aren’t familiar with the area and only relying on reviews of others. We stopped at one of the options and immediately looked at it and said, let’s go with choice 2. We ended up at Charlie’s Cafe. 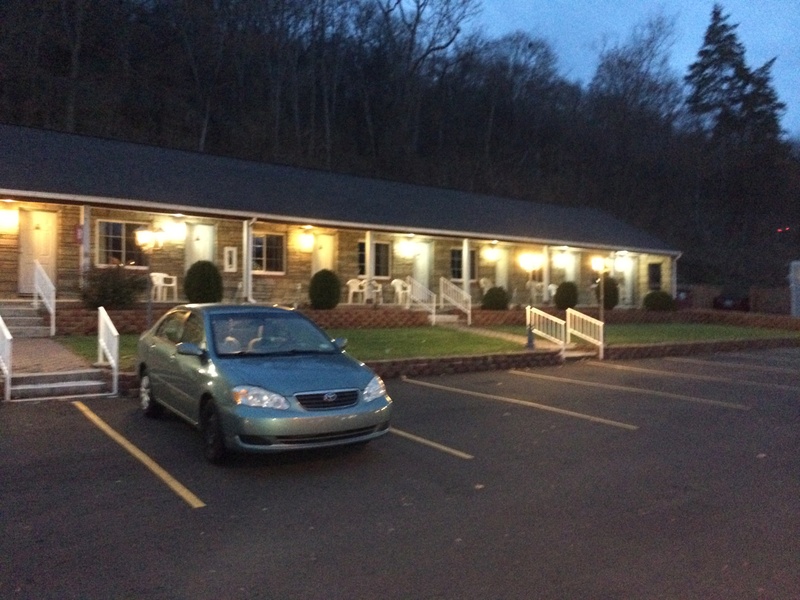 The food was delicious the atmosphere quaint, the service was good but could have been better. The hubby started with a local beer from the brewery the next town over called Horseheads. I enjoyed 2 glasses of Riesling from one of the local wineries on Seneca Lake that we truly enjoy. The best part is the Manager/Owner came by and asked if I wanted another glass, and proceeds to bring me what he called “The Big Boy Glass”. It was noticeably larger than the first glass I was served. I made the comment that it’s good to be “Family”. For dinner The hubby had the Lamb Chops served with loosely mashed potatoes, and green beans and a hunk of acorn squash. I had the Haddock with Wild Rice and the same vegetables. 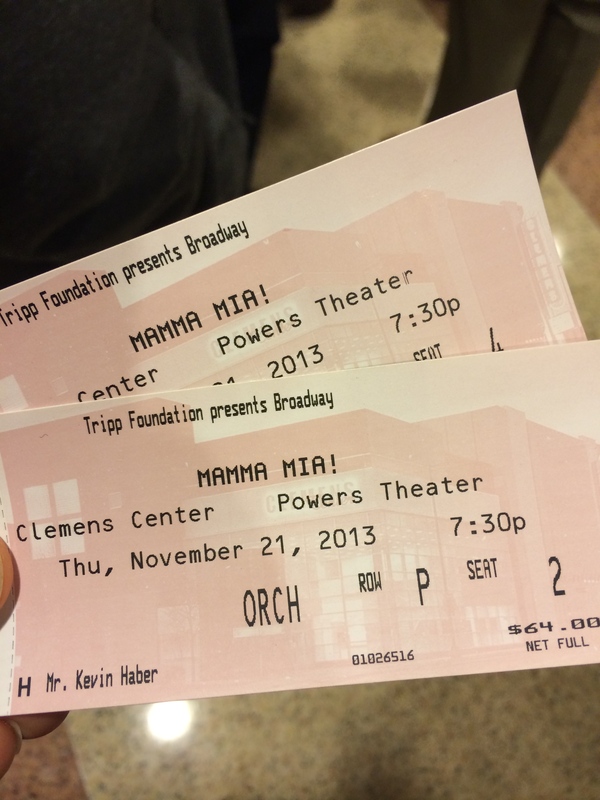 After dinner we found our way over to the theater to see our friend Michael (he lived in CT, but now lives in FL) starring as Bill Austin in the National Tour of Mamma Mia!. If you get the chance and the tour is coming to your city I highly recommend seeing this show. And I am not just saying that because we know someone in the cast. The seats were pretty good. After the show we kidnapped (ok he went willingly) Michael and found this hole in the wall bar, it was either that or his hotel bar where there was Karaoke going on with some of the cast. It was a great to end the night just visiting with Michael over a couple drinks, it was like we have known each other forever. I wish him luck on the rest of the tour! 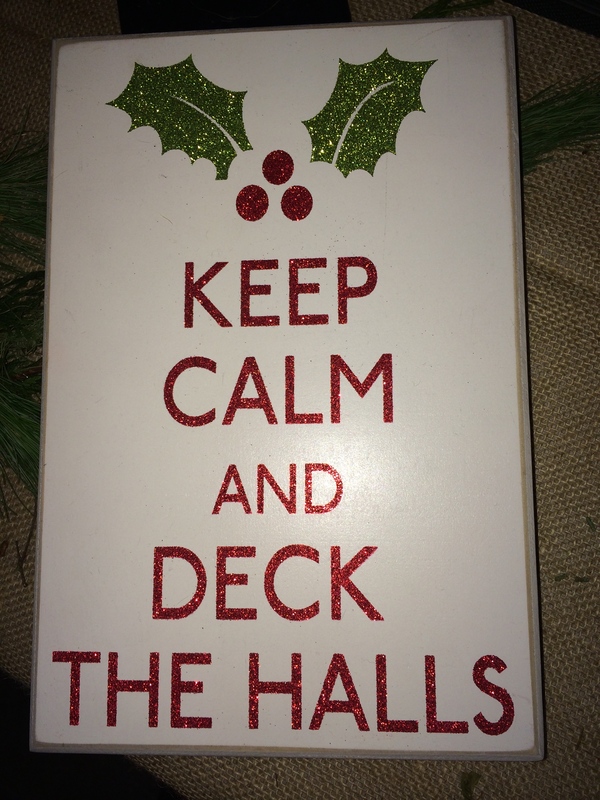 Now on to Day 1 of the official Deck The Halls Weekend.